Connor is really good at immersing himself in play. He especially loves role playing. He will immerse himself into the world of a police officer, construction worker, astronaut, firefighter…and the list goes on. He will turn the playroom into a grocery store or restaurant or shoe store and make myself or Isla the customer. It's one of the things I love about him. How his little brain works and how he plays. It really does fascinate me. 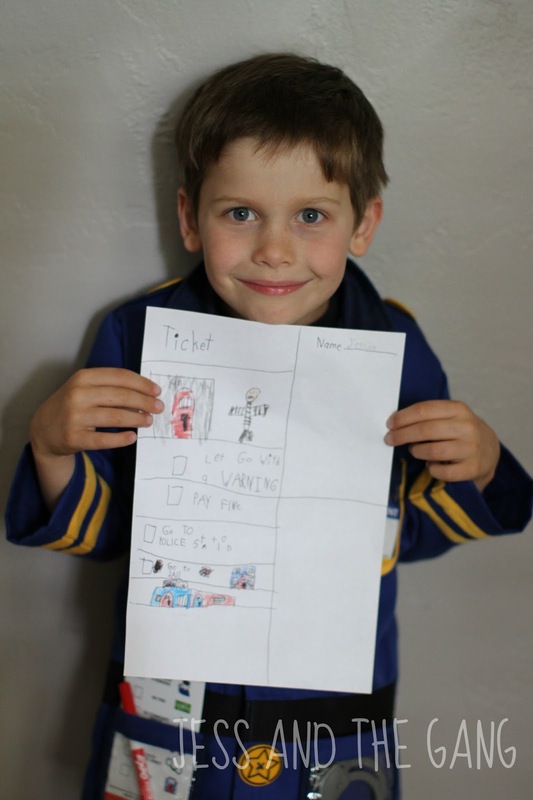 And now he takes it to a whole new level with the drawings he makes to go along with his play. This particular one is a ticket. After letting me choose my punishment, he decided to get rid of all the other options and just take me to jail. Good thing we have an extra key (on my keyring) to his real (yes, REAL) handcuffs because things could get real interesting around here really fast otherwise.